Facebook Advertising: is it worthwhile? The Facebook social network is an enormous, captive audience. But is it worth putting advertisements in front of them? This case study says ‘Yes’. Perhaps the most important thing about Facebook’s captive audience is that each user provides a lot of information about themselves when they sign up. This is demographic information that your adverts take advantage of. But does buying advertisements on Facebook give you enough return on your investment to make it worthwhile? Our copywriter decided, at the end of July 2010, to test the system. She publishes an online music magazine that has a fan page on Facebook. Just prior to setting up the adverts, this page had reached 3000 fans, through an aggressive campaign to get more numbers. While the magazine is global, the Facebook Ad Test was limited to Australians, aged 13 and up. No further demographics were specified. Facebook advertising gives you the ability to spend as much, or as little, as you want to. For this test, the maximum spend was set at $1 per day, for one month. This provides approximately 15,000 impressions (or views) every day during that period of time. And then it was a matter of sitting back and waiting. The way that Facebook page adverts work is this. The profile image, or logo, from your page is the main image. Underneath it is its title and a tag line. And accompanying it is a ‘Like’ button. If you have friends that are already fans, it will tell you how many of them also like the page. If they are good friends of yours, you will be likely to check it out because your tastes are likely to be similar. That, and there is safety in numbers. Within 24 hours of the campaign running, this page had gained another 140 fans. The numbers climbed steadily for a week to a week and a half, and stayed steady, and then they spiked just prior to the campaign’s end. 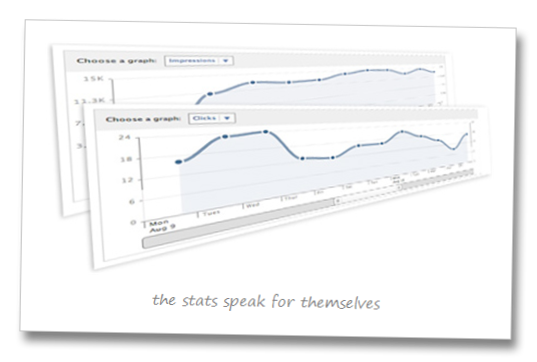 Where the page had been getting approximately 14-20 clicks per day, by the end of the campaign it spiked at 229. Then it rapidly dropped off again. Whether this spike is an anomaly, or whether more impressions were delivered that day, is anybody’s guess. 406,260 impressions (or views), and yielded approximately 600 clicks (or ‘likes’). This is a click-through rate of 0.147%, at a total cost of $31. $1 per day, over one month was $31. In financial terms, this advert cost such a stupidly low figure per view that it’s not worth calculating. And for those who did become fans, it works out at roughly $0.05 per click. Let’s compare these figures to buying print advertising. There is no way that you could deliver 400,000 print brochures at a cost of $31. To buy a classified advertisement in a local newspaper might cost you about $30; but you can’t measure how many views it will get, and it’s hard to find out the conversion rate. And you certainly don’t get national coverage with it. The result of the Facebook campaign is that the page now has over 3600 fans, with absolutely no effort for the last 600. Up until that 3000 figure, it took a year and a half of continual effort, interaction, and encouragement to get people recommending the page through their own networks. And prizes. Let’s not forget that the 3000th fan won a substantial prize pack just for becoming a fan. How this could be improved? The click-through rate is fairly low; 2% is considered a highly successful campaign, according to Wikipedia. What this tells us is that the advertisement itself probably needs to be tweaked. Its title may need to be changed, its tag-line needs to be improved. One further month of testing, with an adjusted advert, might yield greater results. But so could focusing the campaign elsewhere in the world, where the audience might be slightly different, or more in tune with the magazine. Or by tweaking the demographic focus, so that all impressions are delivered to a smaller sample. Either way, this test provides a roadmap for further forays into what is a very cheap and effective advertising campaign. Check out our more recent blog on Facebook Advertising.